Sal Maiorana is a veteran sportswriter who covers the Buffalo Bills for the Democrat and Chronicle. He is the author of 18 books, including Game of My Life: Memorable Stories of Buffalo Bills Football, Buffalo Bills: The Complete Illustrated History, and A Lifetime of Yankee Octobers. He lives in Walsorth, New York. 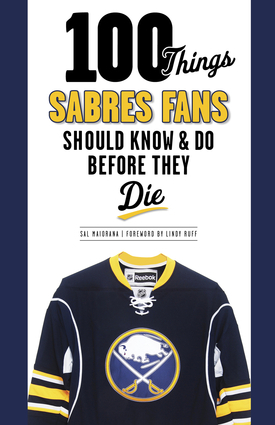 100 Things Sabres Fans Should Know & Do Before They Die was reviewed by Eric DuVall in the Tonawanda News. 100 Things Sabres Fans Should Know & Do Before They Die included in Buffalo Spree. Sal Maiorana, author of 100 Things Sabres Fans Should Know & Do Before They Die, tapes an interview on “Winging It! Buffalo Style” on WIVB/WNLO-TV.